Pythagoras is one of the grand sages and seers of the ancient world. By law of nature, TRUTH is hovered by layers of ignorance and hence is unseen by most of the people. But for a truth seeker who has a genuine pursuit, the TRUTH reveals itself! The same happened with the wisdom of Pythagoras. He gave out to the world a great deal of mysticism but what most of the present day humanity remembers of that is only the “Pythagorean Theorem: Sum of squares of lengths of sides of a right angled triangle equals the square of the length of the hypotenuse“. This is but one among the many principles that he gave out. Even this principle is to be understood esoterically, but instead, the corpse of dry mathematical form is what remains now. Pythagoras is said to have traveled to Egypt, India, etc., which were the then international seats of WISDOM. Some say that the word “Pythagoras” is not the proper noun, but a title conferred upon him in India, for his excellence in discipleship: PYTHA + GURU = International Scholar, which when he went to Greece, became “Pytha-Goras”! Let us leave the debates of validity of history to the historians and take what inspires us from his teachings. “Tetractys” is one of the very fine concepts introduced by Pythagoras to encapsulate the wisdom he possessed. The followers (or decedents in discipleship) of Pythagoras, called Pythagoreans, who still exist in present day world, consider this Tetractys as the “Fountain of Wisdom”. Let us see what this Tetractys is and what wisdom it reveals. This collection of 10 dots with 1 dot in row 1, 2 dots in row 2, 3 dots in row 3 and 4 dots in row 4 is called the “TETRACTYS“. Looks simple isn’t it? But this simple diagram or glyph stands as a “KEY”, a “SYMBOL” and a “SEED” for unlocking vast domains of ancient wisdom. We will touch upon few of them in the following. The primary stage of existence is ONE-Existence. This is represented as a POINT of the first row. This ONE existence of “Everything and Everyone” is represented by “Biṃdu or a POINT” even in TANTRA Śāstra. The reason for this is that, a POINT acts as a seed for the forthcoming creation. Just like in a seed, which has a blueprint of the would-be creation, a POINT has a blueprint of what ever that will be unfolding from it. Also, can you imagine a “point” ? A point has no dimension or we can call it ‘0D’. A non-dimensional entity is impossible to imagine. The moment we imagine, we attribute a dimension to it and hence it implies that we can not imagine. But still we can talk and think about such an entity! This is because, we all originated from POINT and hence we have the essence of POINT in us. So, instead of “analyzing” a point, one has to synthesize with it and become verily IT. This is the GOAL of any spiritual student. Anyways, so, the first stage of SPATIAL comprehension starts with the root i.e., The POINT. The secondary stage is a set of two points as represented by the second row. What comes with a set of two points, that are not identical (i.e., the points are not one and the same)? We get a LINE SEGMENT. What does this segment suggest? It is a One-Dimensional object or ‘1D’ object. A 1D line segment is that stage of differentiation which lets us comprehend the aspect of “Length”. A length occurs only when one point is different from another and thus, we are speaking of “Manifested and Separated” Creation now. We are able to say “She” and “I” etc., due to this second stage of Tetractys. A distinction between “TWO” entities is suggested by the two points and a correlation between them is suggested by the “line segment” that joins them. So, in summary, the second stage of comprehension of SPACE occurs by the 1D line segment of the two points of second row of Tetractys. Again, can you imagine a line? The moment we imagine, we give a thickness to the line and hence we are not imagining it. So, even 1-D object can not be imagined by us nor can it be dealt/felt by us. Can we hold or touch a line? No! The third stage gives us three points of the third row of tetractys. If three points are collinear, i.e., if they form a line, no new information is revealed to us (as we explored a LINE in previous stage). So, the three points must not be collinear. Then what is that, that we get from these points? We get a 2-Dimensional PLANE formed by the triangle, having these three points as its vertices. A 2-D plane represents our comprehension in terms of “Areas”. The surface area of an object, the area of a plot, the plane of Earth’s surface that we see, surface of water beds, etc., are all being possible to comprehend by us due to this third stage of Tetractys. We are able to travel on waters, walk on Earth, watch movies on the screen and do what not because of this 2-D comprehension? So compared to 0D and 1D, ‘2D’ is giving us more interactive freedom with the space around us! But still, we can not imagine a plane in ts complete ideality. If you try to imagine a plane, you will attribute a thickness to its edges by default (because we can not imagine a “no-thickness” ever!). This will defy our definition of a plane being 2D surface (as the thickness adds another dimension to the plane). So, not even 2D surface can be properly imagined by us! But we can touch a surface, unlike a line or point! The final and fourth stage of creation is represented by the fourth row of the Tetractys. This gives us 4 points that are not co-planar, for if they are, we won;t get any new information. So, what is the figure formed by the four non-co-planar points? We get a Pyramid or a 3-Dimensional Object. A 3-D object is very comfortable to imagine. We can not only touch the object, but we can also imagine and feel the object in our heads. So, this fourth stage represents completely manifested creation. Thus, the slow evolution of our comprehension of SPACE from a point to a line to a plane to a SPACE is described by the 1, 2, 3 and 4 dots of Tetractys. The number of stages of Vāk or Speech are given to be four: Parā Vāk, Paśyaṃtī Vāk, Madhyamā Vāk and Vaikharī Vāk. Parā is akin to point (1-dot) – it is imperceivable and hence represents an “impulse to speak”. Paśyaṃtī is akin to a line (2-dots) i.e., it represents a cloudy idea in our mind. Madhyamā is akin to a semi-perceivable plane (3-dots) and hence represents a mental blue print of the idea that we want to convey. Vaikharī, the final one, is the uttered physical word which is akin to the manifested pyramid or completely perceivable object (4-dots). Thus, the 4 rows of tetractys also represent the four stages of VĀK. This VĀK is what is uttered by the creator BRAHMA, as his daughter SARASWATHI. These four stages are symbolical to his four heads! So, his uttered creation also has four stages, in his likeliness, of perception as mentioned in previous paragraphs. In Puruṣa Sūkta, there is a line that says “Pādōsya Viśvā Bhūtāni Tripādasya Amṛtaṃ Divi“. It means that “three-fourths of the creation exists in immortal divine planes while the remaining one fourth of creation manifests as the physical perceivable cosmos“. The “Spatial Dimensions“, “Vāk” and “Puruṣa Sūkta” are all linked! Can you see how? The three stages of spatial dimension – 0D, 1D and 2D are not perceivable by us in complete fashion. Also, they are kind of fictional for us, because we can not create a perfect point or line or a plane ever! Similarly, the first three stages of Vāk: Parā, Paśyaṃti and Madhyama are all in our head. They are impulse, cloudy idea and mental blue print respectively, and thus exist inside our head. They are not manifested yet. So, they are not perceived by “another” human at all! Similarly, according to Puruṣa Sūkta, this whole cosmos has four stages – three stages are hidden or DIVINE i.e., imperceptible. But, only one fourth of cosmos is perceivable according to Puruṣa Sūkta just like the 3D object (fourth stage of spatial dimension) or the Vaikharī Vāk (fourth stage of Divine/Human Speech) of the above examples. Is this not a Beautiful link to be meditated upon?!! When one closely observes the Indian scriptures and Tetractys together, one can easily find a link in terms of cycles of TIME. The numbers 4, 3, 2, 1 are universally used to represent cycles of TIME – (go to Kabbalah or Vēdās for example). Here, let us see how Indian division of time cycles use these numbers of tetractys! 4 3 2 forms the base number for the calculation of time scales. Mineral, plant, animal and humans — all evolve in different speeds and hence different time scales are used for each. For example, 432 Earth years gives historical periodicity or 4320 Earth years give the cycles of floods of World oceans, etc. The number that we know publicly as “432000 Earth years” represents the time taken for a cosmos to complete one unit of “YUGA” or a “Cycle of TIME”. This UNIT is called “KALI” and hence the duration of time of 432000 earth years is called “KALI YUGA“. The duration of this YUGA forms a base of measure of succeeding yugās and cycles of time. These are the four yugās that are spoken of in the scriptures of the East. Did you see the link to Tetractys yet? See the colored “Unit” that is multiplied to the base number of 432000. What do you see? 1 2 3 and 4, right! These are the same number of dots as in Tetractys. Let us now add these units i.e., 1+2+3+4. What do we get? 10. Add all the Yugās as mentioned above: 432000 + 864000 + 1296000 + 1728000. What do you get? You get the same base number with an added 0 at the end i.e. “4 3 2 0 0 0 0“ This is called one “Mahā Yuga” – “The Great Cycle of TIME”. So, Pythagoras gave out all this by just the diagram of “Tetractys”. The tetractys is sometimes called a “Decad“, for it has 10 dots. Its 4 3 2 1 dots and the total numerical-value of 10 are what constitute the whole set of cycles of TIME or Yugās. There is more to the yugās like Manvantarās, Days of Brahma, Age of Brahma, etc. This is important to know to study the “evolutionary patterns” on a cosmic scale. For example, one manvantara has certain kinds of humans while the other has different ones. These are hinted in our Purāṇās and Itihāsās in form of Gaints, Cyclopses, Ape-Men, etc. The same is also recorded by world scriptures, as proved in ” The Secred Doctrine” by H. P. Blavatsky. So, to understand this grand scale of evolutionary cycles, we need to have the key of TETRACTYS. Pythagoras used it as a simple tool to expound on that wisdom! The 5 senses + Mind and Buddhi – Forming a total of 7 causes the matrix of JĪVA or the Being in this physical frame which is again made of 7 dhātūs! 3 x 7 = 7 (creator) + 7 (sustainer) +7 (destroyer) = 21 fuel sticks. See, the same was obtained from Tetractys as well. One should know the “key”. Once the key is known, one can form links to all paths of wisdom without any friction. Also, the numerical value of “number of dots” gives us 10 right! 10 is innate in us. We are “Decimal Beings“, which computers are “binary“, for example. Also, we think only in terms of integral numbers. Here, I am using the word “think” to be synonymous to “feel and experience”. Can you think of “0.234” or “0.5” at least? The moment you want to half an object in mind, you get confused as to how to accurately make equal halves! Then for sure we can’t think of “0.234”. What about “√ 5” ? So, other than integers, we can;t think of any number as such!!! This is because of the play of angels called “Prajāpatīs or Patriarchs (of testaments)”. There are 10 prajāpatīs who act as lords of NUMBERS. It is by their grace that humans acquired the ability to count. It is by their grace that humans are dealing with so much math even though they do not “KNOW” what it means!!! This play of TEN-NUMBERS in our lives is smoothly suggested by the “Decad” of Pythagoras. The nature’s way of suggesting the same exists in we having 10 fingers, which are often used to count when calculator is not there! Pythagoras should have chosen a fifth row by adding 5 dots for his diagram, right? But, why did he stop at fourth row? Because the four-rows completely describe all the aforementioned concepts related to cosmos. So, it is evident that Pythagoras wanted to teach these concepts to his students through the beauty of 4 – 3 – 2 – 1! The Tetractys is basically a triangle. The moment we see triangles, any Indian occult student will remind themselves of the beautiful “Tantra”. Triangle is the base of any tāntric figure. And a triangle having the numerical value of 10 (dots) certainly implies the 10 “Tattvās” of Tantra, represented pictorially by the triangle of DIVINITY! These are called “Daśa Mahā Vidyās” or Wisdoms pertaining to “Ten forms of the MOTHER” whose glory we celebrate as 10 days of the festival of “Dussehra”. The triangle whose apex is upward is called the triangle of “ŚIVA” and the triangle of apex downward is called the triangle of “Śakti”. I think most of you know this. But have you ever thought why? We can know the reason from the above understanding of Tetractys! The numbers 4 -> 3 -> 2 -> 1 can be associated as: 4 to the fully manifest and 1 to the pure unmanifest, right? Now, if the apex is upward, that means the starting number is 4 and the ending is 1, if we start counting from bottom. One may ask as to why count from bottom? The “bottom” is where we stand and the top is where we have to reach. Bottom is our plane of perception or support, while the “top” is related to divine planes. So, it is reasonable to start counting from bottom. So, a triangle with its apex upwards represents “Path of Ascent” or “Culmination with Divine” as we go from the “manifest” to “un-manifest” in this triangle and hence is called “Triangle of ŚIVA – The lord of Divine Culmination“. The triangle with its apex down ward ha sits numbers as, counting from bottom, 1 -> 2 -> 3 -> 4. So, this represents the path of “descent” or that path which starts from “un-manifest” and culminates in “manifest”. Who is responsible for manifesting this creation? It is the consort of Śiva i.e., ŚAKTI. That is why, this triangle is called “Triangle of Śakti“. What happens when you unite these triangles? You get a double triangle which forms the BASIC esoteric symbol for almost all ancient civilizations! In tantra it forms the divine union and thus forms a basic part of almost all the “Yantrās” or “Chakrās” of worship. It is nothing but the dynamic interplay of Śiva and Śakti through the paths of manifestation and culmination. In Kabbala, the ancient art of the EAST, we have a concept called “Tree of LIFE“. Tree of LIFE has a very close intimate connection with the Pythagorean Tetractys. 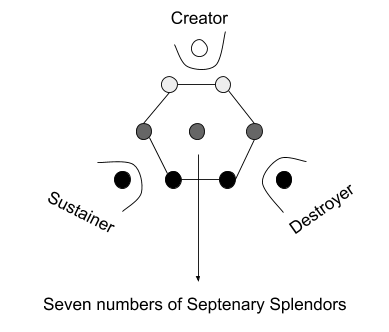 The above diagram shows how one can obtain the 10 “Sephirah or Sefirot” of the Tree of life from the “Ten dots of Decad” itself. The subject of tree of life is like studying the heart of kabbala and thus is very vast. I may dedicate another article on this in future. For now, I will leave at this small hint of visible connection. Thus we have explored the grandeur of Pythagorean wisdom in regard to TETRACTYS and its special connection with the ancient wisdom of the scriptures. I hope you enjoyed the read. I know it is dense, but I really hope that it helps a truth seeker in pursuit of proper connections between different ancient systems, especially connected with TANTRA, KABBALA and PYTHAGOREAN systems. this is so interesting,reblogging it. …. I am also just re-reading what came through me in this article. It is actually nice and interesting! (not to self-gloat :p ).